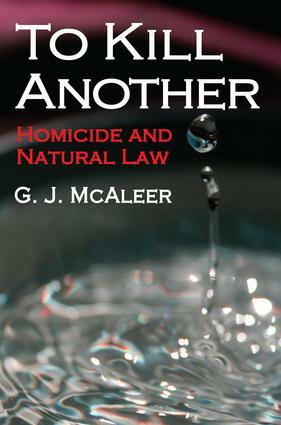 Basing his argument on natural law, Graham J. McAleer asserts that only public authority has the right to intentionally kill. He draws upon the work of Thomas Aquinas and Francisco de Vitoria, defending the claim that these natural law theorists have developed the best available theory of homicide. To have rule of law in any meaningful sense, the author argues, there must be protections for the guilty and prohibition against killing innocents. Western theories of law have drifted steadily towards the privatization of homicide,despite the fact that it runs counter to rule of law. Public acts of homicide like capital punishment are now viewed by many as barbaric, while a private act of homicide like the starvation of comatose patients is viewed by many as a caring gesture both to patient and family. This subversion of the rule of law is prompted by humanitarian ethics. McAleer argues that humanitarianism is a false friend to those committed to the rule of law. The problem of human vulnerability makes political theology an inescapable consideration for law. Readers will find much to reflect upon in this book. McAleer's argument can be read as a cultural chapter in the history of moral ideas, but also as a close and timely reading of a grim subject. Is Carl Schmitt Right? Is Just War Impossible?